I am enough of a chess enthusiast to argue that chess should be included in the Olympics. I think it takes a lot more to be good at chess than it does to be good at… water polo. Or badminton. Or team handball. I mean, think about all the ridiculous sports that have been in the Olympics. Chess doesn't rank as better than those? When IBM wanted to prove they had a smart robot, they made it good at chess! If a robot is good at chess, it's good at anything and will soon turn humanity into its pawns as long as we only attack at a 45 degree angle. Besides that, it's the king's game! 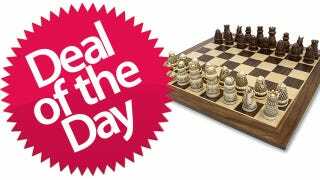 And what better way to celebrate that fact than to go medieval with your chess set for 43% off? How Were These Ever Considered Olympic Events?